Photo: Stephen Bugno. Creative Commons BY-NC-ND 2.0 (cropped). It was January and the middle of Cambodia’s dry season when we visited Phnom Kulen National Park north of Siem Reap. Our guide told us the local people prefer cattle over water buffaloes because cattle work so much harder: “Water buffaloes are lazy, and all they do is eat and get fat”. This was rather disappointing from a visitor’s point of view, since water buffaloes are such a classic part of the landscape you expect to see in South-East Asia. A colleague had already remarked on how the bullocks in Cambodia look rather scrawny compared to those in her native India. And it is true that I didn’t see any water buffaloes working, though I did see quite a few healthy-looking specimens chowing down on grass and, true to their name, hanging out in or near the few pools of water puddling the dry landscape. The guide said that in parts of Cambodia with more water, farmers can grow two or even three rice crops a year, but here in the north they can only grow one during the rainy season. In the dry season the farmers “just do nothing”. This seemed like a harsh judgment, as I did see some evidence of dry-season livelihood diversification in the form of orchards and a few other crops. Still, the guide came from a farming family, so he spoke from experience, and it was hard to miss the many hectares of seemingly idle land stretching to the horizon. Like the water buffalo, the people cannot do much without water. My colleagues and I were in Siem Reap for the Sixth Global Conference of the International Partnership for the Satoyama Initiative (IPSI-6), hosted by the Ministry of Environment of the Kingdom of Cambodia, and organised by the United Nations University Institute for the Advanced Study of Sustainability (UNU-IAS), which serves as the IPSI Secretariat. The three-day conference included a meeting of the IPSI General Assembly, a public forum — where many presentations focused on projects in and around the Siem Reap area — and visits to local sites. Water was one of the major themes throughout. Site visits were organised with a great deal of help from Cambodia’s National Authority for the Protection of the Site and Management of the Region of Angkor (APSARA), which oversees the management of the Angkor Wat temple complex and also takes a larger role in directing land use and — at least equally important — water management across the larger landscape. APSARA staff explained that this is not just important so that the millions of yearly visitors to Angkor Wat can take showers or the moats can be kept attractively full for tourists’ photos. The temples will actually fall down without good water management. Most of the water used by people in the area comes from groundwater. Angkor Wat is built on a substrate of sandy soil, which is kept firm and in its current shape by the groundwater contained in it. If too much groundwater is taken out and the water table falls too far, the ground will collapse below the huge stone temples (see the Angkor Charter for more information on the water issues in the area). Some of the temples have stood for a thousand years, and this may be the biggest threat they have ever faced. Tourism at Angkor Wat has grown to two million visitors per year, and is expected to reach five million in the next few years. Worldwide interest in seeing the ruins pumps money into the area, bringing development unlike any that has been seen in the region since Angkor was in its prime eight hundred years ago. But expanding tourism and infrastructure has meant an equally dramatic increase in water demand. The growing interest in Angkor Wat could ironically be the thing that destroys it. To avoid this outcome, APSARA, with a great deal of collaboration from the IPSI partner organisation Live & Learn Environmental Education, is involved in an ambitious project to return the groundwater to a sustainable level and ensure the water supply for Siem Reap. One look at the landscape in the dry season shows how precious water must be. Brown, dried-out fields stretch as far as the eye can see. The fields are deliberately burned at this time of year, so many of them are charred black. From the bus window after the sun has set, you can only see lines of orange fire in the blackness. Ancient Angkor needed huge reservoirs to ensure the water supply. The major waterway in the area is the Siem Reap River, but there are no valleys suitable for dams. The reservoirs here were artificial — dug into the landscape as broad and shallow rectangular lakes. Most of the reservoirs were later drained or fell into disrepair, and some of the biggest now look like fields rather than reservoirs. APSARA has already succeeded in refilling one of the reservoirs with water — the “Northern Baray” with the artificial island Neak Pean at its center and a Buddhist temple on the island. The site’s sophisticated hydraulic engineering forced the reservoir’s water to flow up into the temple pools from underground. This water was thus made holy and believed to have healing properties. Research is underway to discover what substrate materials were used to make this flow possible. 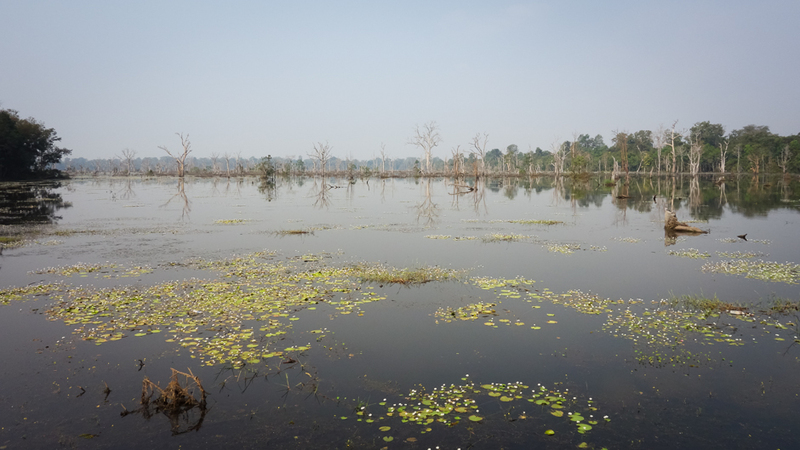 While the restoration of the Northern Baray seems to be a great success, management of the landscape as a whole remains a challenge. 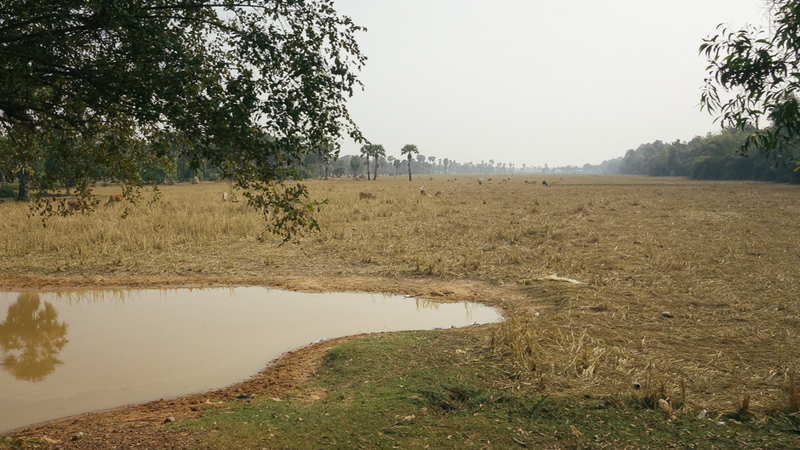 A bigger reservoir — the “Eastern Baray” — remains dry, although Live & Learn estimates that filling it could meet the water needs for the whole Siem Reap area. It is now used as agricultural and grazing land, and a village of some 3,000 people has grown up in the middle of it. Managing the landscape means accounting for land and water use, but also the many, sometimes conflicting, interests of the people who live there. 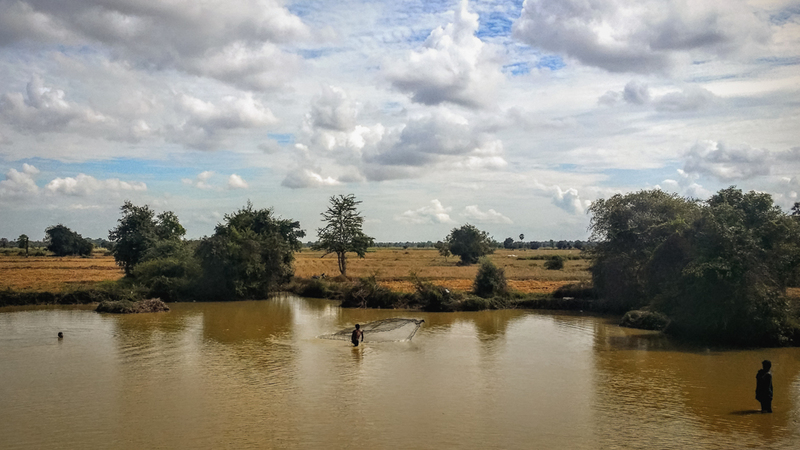 The Satoyama Initiative — the focus of the conference in Siem Reap and the focus of my research project at UNU-IAS — is an effort to explore resource management at the landscape level by looking at the landscape holistically. In cases like the landscape around Angkor Wat, this can mean balancing, reconciling, or ideally finding win-win solutions between competing priorities, like when a refilled reservoir can be a new tourist attraction and also provide water for local farmers. Conferences like IPSI-6 bring a wide variety of parties together as one step in this process. Both APSARA and Live & Learn Environmental Education were there, along with municipal, provincial and national government representatives and local NGOs, students, private-sector parties and other stakeholders in the local landscape, not to mention partners from around the world. The hope is that bringing people together like this will result in the best solutions for all parties. Our trip to Phnom Kulen National Park came after all of the IPSI-6 activities, when we could finally relax. But water and its use in the landscape continued to be a salient issue, as seen in the conversation about water buffaloes and dry season farming practices. As part of the field trip, we visited Kbal Spean, the “river of a thousand lingas”. This required some explanation on the part of the tour guide. A linga is a cylindrical representation of the god Shiva. When the tour guide said that the top three positions in the Hindu cosmology are the trimurti (“three forms”), being Brahma the Creator, Vishnu the Preserver, and Shiva the Destroyer, I misheard “preserver” as “reservoir”. A linga is often found framed by an enclosure called a yoni, representing the goddess Shakti. The male cylinder surrounded by the female enclosure represents Shiva’s role as the god of procreation. But wait, I thought Shiva was “the Destroyer”. Can he also be the god of procreation? Yes, it turns out, he can. 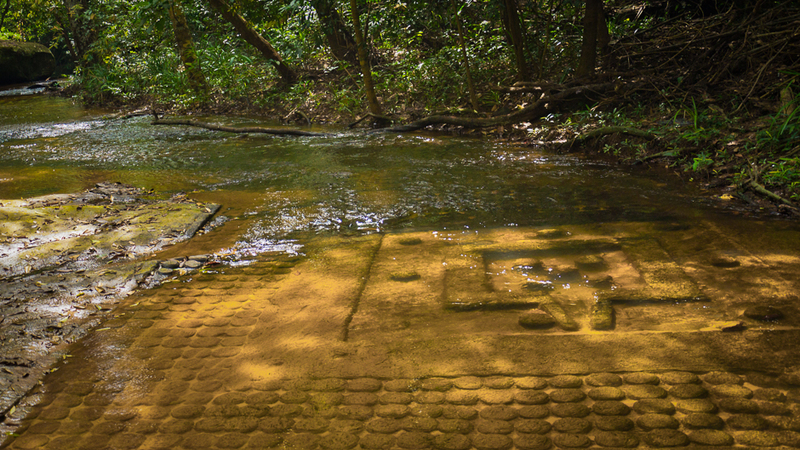 In any case, the river bed is stone, and is carved with many small lingas forming a dense grid. The guide was sure that there are many more than one thousand of them, despite the river’s nickname. In places there are larger lingas, representative carvings of various gods, and other features. The river water flows over all of these and, like the water at Neak Pean, becomes holy and imbued with powers, particularly helpful in this case for those wishing to have children, thanks to Shiva’s procreative powers. The lingas were carved at the same time many of the Angkor temples were being built, and they have somehow stood up to erosion for almost a thousand years. It occurred to me that the Angkor complex has seen the whole trimurti in its history. Brahma the Creator was in force when the temples were being built as part of one of the greatest cities in the world at the time. Since then, Shiva the Destroyer has been at work with a thousand years of wind and water erosion, invasion by the “strangler fig” tree that works its roots between the stones and slowly pulls them apart, looters and many other destructive factors. Angkor Wat was rededicated to the Buddha after Cambodia became a primarily Buddhist country, but it seems telling that it was originally dedicated to Vishnu — Vishnu the Preserver, or “Vishnu the Reservoir” as I heard it. Now the “preservation” of the whole complex may depend on its reservoirs. Water is just one aspect of the landscape, but from what we have seen in Cambodia, it would be hard to overestimate its importance. Cattle may be more highly valued by the local farmers, but because they are so diligent, they are made to work until they appear skinny and tired. They may be a good model for the hard work it will take to conserve the landscape around Angkor Wat in the face of rapid development, but maybe we also have something to learn if we consider the water buffaloes, who stay fat and robust precisely because of their deep attachment to water. 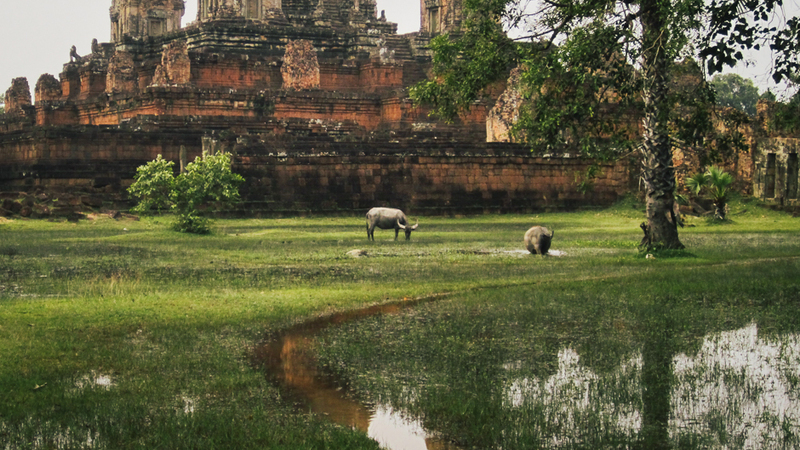 Consider the Water Buffalo: Landscape Management Around Angkor Wat by William Dunbar is licensed under a Creative Commons Attribution-NonCommercial-ShareAlike 4.0 International License. William Dunbar is a Communications Coordinator with the International Satoyama Initiative project at the United Nations University Institute for the Advanced Study of Sustainability (UNU-IAS) in Tokyo, Japan.